Brian MacDonald’s band PVRIS - pronounced Paris - are the top of the pops among the rock-loving youth, and with their eagerly-awaited second album on its way, they’re set to rise a long way in a short time. “I don’t really look at it like that. 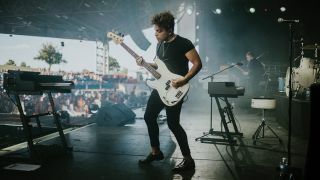 I’m just sitting in it and just enjoying it,” muses Brian MacDonald, softly-spoken bassist with PVRIS, when we ask him how it feels to be one of the most attention-grabbing new bands to come out of America in years. What was your first bass, Brian? So what’s your current gear? Why switch from J to P? Your new album, All We Know Of Heaven, All We Need Of Hell, has a ton of bass all over it. Which other bassists do you admire? What do you like about playing bass? Do you use amps live? 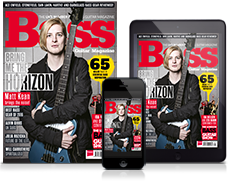 “We recently switched to Kemper, which is perfect. I just run through that and go straight to the front of house and it’s amazing. When I first started I had an Ampeg 6x10 cab and an SVT 4 Pro head, but that blew up on stage, ha ha! It was unfortunate. That was my very first bass amp. All We Know Of Heaven, All We Need Of Hell is out now on Rise.